Carob is not chocolate. You can, however, substitute carob in recipes calling for chocolate, although the texture and flavor is not the same. Carob contains about the same amount of fat and calories as chocolate, but there are some healthy advantages to carob. 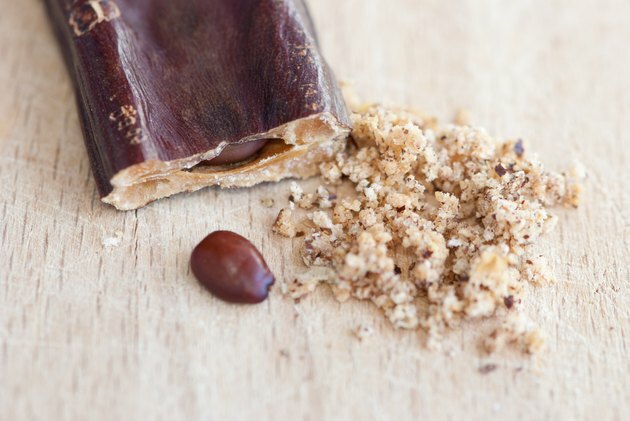 Unlike chocolate, carob is caffeine-free and contains three times as much calcium. Carob contains 55 to 75 percent sucrose. Sucrose, also known as saccharose or table sugar, is composed of two different sugar molecules, glucose and fructose, joined together. The sucrose structure is unique because the six-carbon ring of glucose is joined to the five-carbon ring of fructose, leaving no available reactive functional groups. This makes sucrose a "non-reducing" sugar, unable to make long chains of sucrose molecules. Eating sucrose provokes a rapid rise in blood glucose levels which can be a problem if you have diabetes, hypoglycemia or other defects in sugar metabolism. Carob contains 7 to 16 percent fructose. Fructose tastes roughly 1.2 to 1.8 times sweeter than sucrose in most foods. This perception of sweetness peaks earlier and falls later than both sucrose and glucose, and in combination with other sweeteners and starches synergistically boosts the sweetness of that food. Under acidic conditions, fructose will not hydrolyze, keeping flavors stable for extended periods of time. Cookies made with fructose stay softer than those made with other sugars because once solubilized in foods, fructose has difficulty recrystallizing. Compared to glucose and sucrose, fructose has a low glycemic index, meaning that ingesting fructose results in only a moderate release of insulin to the bloodstream. Carob contains 7 to 16 percent glucose, a monosaccharide or simple sugar. Glucose, the major carbohydrate source of energy in living cells and the main product of photosynthesis, starts cellular respiration in both plants and animals. Glucose can exist in two three-dimensional forms, a D form and an L form, which are mirror images of each other. D stands for dextrorotatory, as solutions of D-glucose or "dextrose" rotate polarized light to the right, while L stands for levrorotatory, because solutions of L-glucose rotate polarized light to the left. Your body only recognizes the D form. L-glucose does not occur naturally in living cells and cannot be metabolized by cells. Several other sugar molecules exist in carob, but combined only make up about 0.5 to 3 percent of carob's overall sugar content. Some of these sugars include inositol, a carbohdydrate not classified as a classical sugar, but rather as a B vitamin, that has a small amount of sweetness. Carob also contains galactose, a monosaccharide that tastes slightly less sweet than glucose, and mannose, a six-carbon sugar monomer similar to glucose, but not well-metabolized by your body. Carob also contains xylose, a five-carbon sugar having antibacterial and antifungal properties.